“It was pretty clear from Joan (Vila) and Rob (Greenhalgh) that we wanted to hit the right side of the course in the first upwind looking for more breeze,” explained Fernández. MAPFRE then managed to stretch out to a lead of nearly one-minute at the bottom gate, giving them a lead they would enjoy the rest of the way. But behind them, it was a hard-fought race. Sun Hung Kai/Scallywag was strong on the first leg, but dropped back over the course of the race. 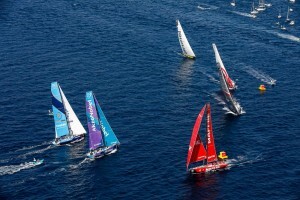 In contrast, Dongfeng Race Team fought up the fleet to grab second place, battling with Vestas 11th Hour Racing and Team Brunel who were trading places throughout the race. “It was okay. Fifth’s not great but it was okay. We were second at the top but we just made one mistake on the first run and it cost us. Basically, it was good. Amazing to be racing here in Alicante,” said David Witt, the skipper of Sun Hung Kai/Scallywag.